Locking down your love in Salzburg, Austria – Why Waste Annual Leave? I remember a time, not so many years ago, when I would rather have faked a migraine and cancelled a date than allowed Pumpkin to see me with my glasses on; my hair straighteners would singe my locks on a daily basis and I would have been mortified to have ordered dessert at a restaurant if he was calling it a day at mains. How things change. Nowadays, I eat more than he does when we’re out and I’m fine with this. Most of the time, I’m in my pyjamas with my four eyes on as soon as the working day is out and my hair, far more frizz-tastic than he’d ever have cared for. This, my friends (I hope) is not lack of effort – this is contentedness, a feeling of comfort in your own skin in the presence of those you trust the most. But one can’t help but wonder whether this state of marital equilibrium comes with a price? Does it signify the end of the “butterfly” phase of a relationship? Fortunately, every so often, sometimes at home and sometimes on our travels, the butterflies make a resurgence. A magic moment springs out of nowhere, conjuring up nostalgia about how it felt in the beginning. I had one such pang of emotion on a dusky stroll along the Makartsteg bridge in Salzburg, (which I’ve chosen to Christen the bridge of love), where thousands of infatuated couples have left their amorous thumb prints by engraving padlocks and tying them onto the bridge, leaving behind their legacy of love. If you are a man, who has been postponing that milestone moment because you’re buckling under the pressure that modern consumerism has inflicted upon you to be original, thoughtful and romantic, maybe this is the place for you. If you don’t want those 4 words to be written in chocolate sauce at a restaurant and you don’t want to submerge your prized jewel inside a baked good, have you thought about writing it on a love lock and proposing on this bridge as the sun goes down and the blue and golden lights form dimples in the water? I know it sounds cheesy and I’m the first to admit that I am a hopeless romantic but if it were me, I would love this. In fact, I found it so endearing reading the padlocks and their sentiments of love that for a split second, I almost wish I could have got unmarried and un-engaged just so that I could do it all over again here on this bridge in Salzburg. I’ve made Pumpkin promise that one day, we shall put our own lock on one of these bridges (we saw one in Cologne 2 years ago so that’s 2 missed opportunities now). If you’re a bit of a dreamer like me, you could spend hours, just reading one after the other. I am the same when it comes to park benches engraved with messages of remembrance. Loved ones may have passed on but these messages give the rest of us an opportunity to understand the memories they inspired. But I digress. The real question with the locks is, where does everyone get them from? There are very few shops selling them, certainly not from a quick glimpse around anyway. We found just one nearby store selling a standard red one, which explained the abundance of matching crimson love locks on one end of the bridge, presumably the side which hadn’t yet been infiltrated by the lovers of yesteryear but the wide array of colours, shapes and sizes occupying most of the bridge remains a mystery. I think this is all pre-meditated. Couples (and families) all over the world who want to spread their love with the world do their homework in advance, bringing their padlocks with them. I’ve now seen one in Germany, one in Austria and know of one in Paris, arguably the world’s most romantic city. Do you know any others and have you made your mark on any of these bridges? Really? I hadn’t realised there was one there! Seems wholly apt I suppose! haha, great entrepreneurial flair on your part! They really are charming Samantha especially if you’re a hopeless romantic like I am and there seem to be a lot of them dotted around Europe! I hear you about the marriage thing. It’s kinda nice when you DO dress up though and see that look in your Pumpkin’s eyes – even if it’s just confusion! Hehehe, it really would be confusion I think! Although, much to my surprise, he booked dinner for Valentine’s day so maybe I’ll make a bit of an effort and see if he notices! I’ve heard so much about this beautiful city, I think I need to visit for myself soon! There’s a lock bridge in Prague, near the Lennon Wall. That was one first one I’d seen so I thought it was uniquely Prague, but then I visited Paris and found it wasn’t at all unique! And I was going to use my own padlock to leave there, but I’d had it for years and it’s the only combination I seem to remember. So I decided to keep my laptop safe back at the hostel rather than be romantic! In the future I’d probably have to get one in advance. Yes that’s exactly how I felt when I saw the one in Cologne before I realised there are so many of them! Good call with keeping your laptop safe – romance can wait!! Sweet! Love locks are the best! Thanks so much for reading 🙂 The concept is so endearing so I’m really keen to leave a lock one day myself but both of the bridges I’ve seen, I’ve come across purely by chance – maybe I just need to keep a lock in my pocket on standby!! Verona has a gate that you attach your love lock too and you can buy them at the shop in the courtyard in a variety of colours and shapes. 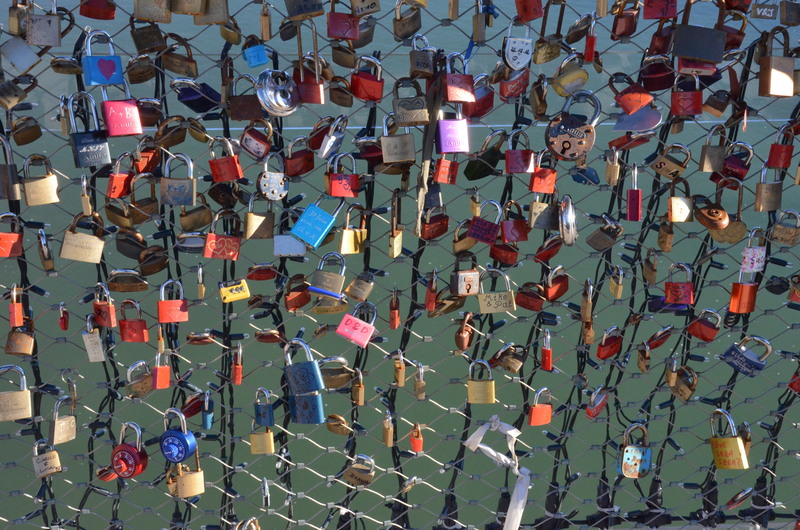 My sister took a brilliant photo of some love locks in Makarska in Croatia! They do make you smile whenever you see them on your travels. 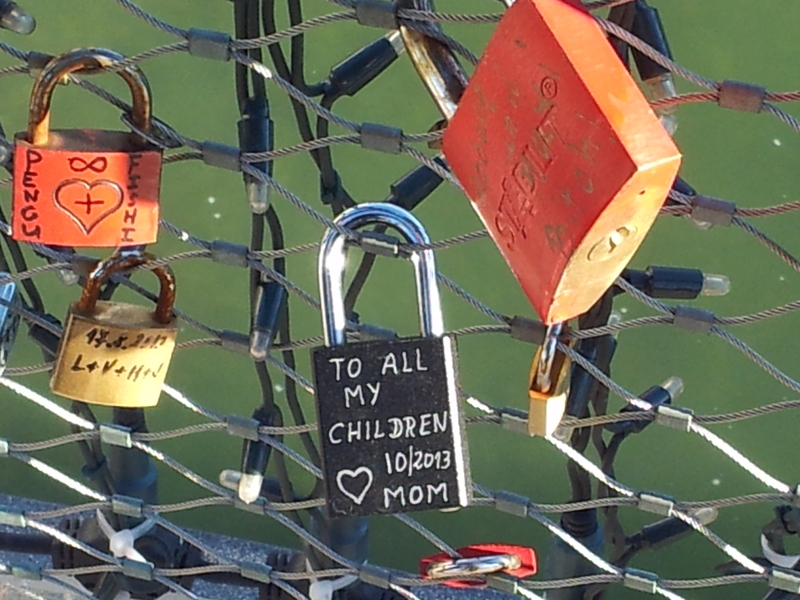 I love the mom that put that love lock on the bridge – I think that is a truly sweet mum! 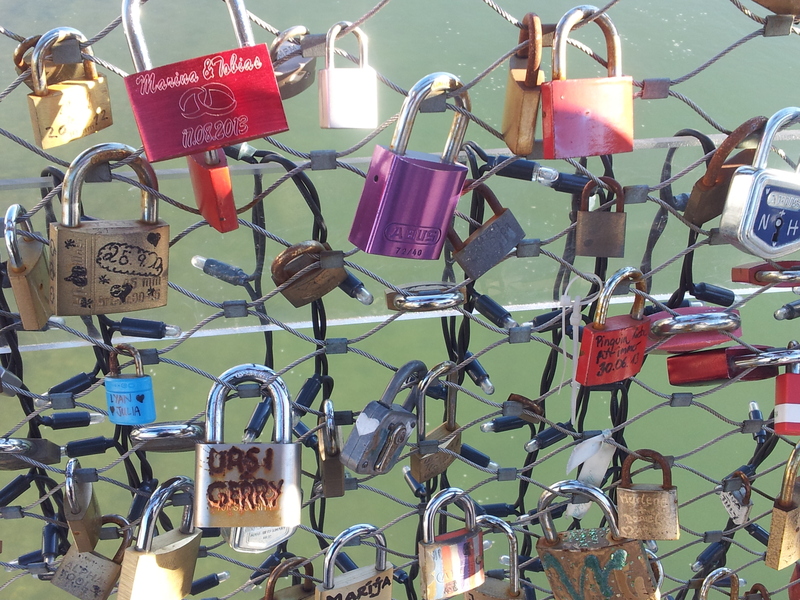 My partner and I had a very special moment when we put our lock on this bridge in Salzburg! awwwww!! 🙂 I am such a hopeless romantic that stories like this totally perk up my day!! Thanks for sharing that on here – so delighted to hear that the two of you had a chance to put a lock up! And I really hope you do get to go back one day and spot in amongst all the others – I’ve seen a couple of these now so it’s high time I got a padlock tied onto one of these bridges! Pingback: A Day Trip to Southwold, Suffolk | Why Waste Annual Leave? I did not expect this bridge, I was looking for the locations of Sound of Music but was disappointed. Well my guide was so efficient & really knows his business. 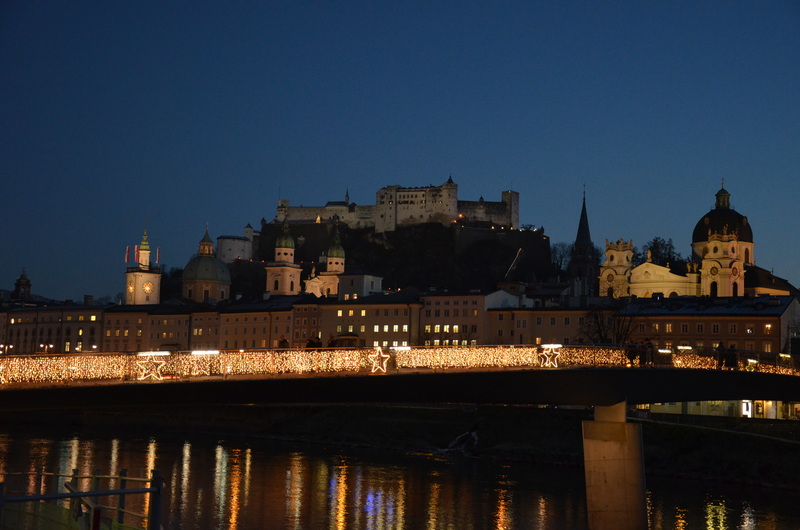 The bridge was our first stop in Salzburg & we covered the whole town in 1/2 a day. I read about this kind of bridge in Paris, but this is my first. In July my niece & I are going to Cologne so I will look for this bridge & make sure I to bring one padlock w/ me.My niece & I love Salzburg!!!! I loved Salzburg too – such a pretty place! We saw this bridge by chance too and absolutely fell in love with the sight of it especially at sunset. We wished that we had a padlock with us at the time!! Cologne was the first place I ever saw a love lock bridge and had never seen the concept of it before. I hope you and your niece have a wonderful time there and don’t forget your lock and key 🙂 Thanks so much for reading! My wife and I have a lock on the Makartsteg in 2017 during our stay in Salzburg. I wanted to do something a little special for my wife, so I did a little research before our trip and had a lock engraved (with our names and the date of our first date.) I then tucked it into my camera bag, so that when we were crossing the bridge on our wedding anniversary, I could surprise her with it. After we attached our lock, we spent a good hour or so reading other locks before continuing onto dinner. BTW… I love your site, so keep up the great work! Hi Robert. What a truly lovely thing you did for your wife by surprising her like this! How thoughtful & I love the fact that there will be a special memory there on that lock commemorating that first date you had. She must have been so moved by the gesture! Thank you for sharing this pic and your story. It’s hearing comments like this that are one of the nicest aspects of writing a blog & I’m delighted that you read & scared your own memories of this padlock bridge. I love these love lock bridges & could happily spend hours reading all the individual names and messages of love that lie within them.